Verdict: The sauce was great but the meatballs were lacking in flavor. The meatballs I made for the subs back in December were much more flavorful. These can be tweaked more to suit our tastes, but what made me want to try these in the first place was that they are baked. finally, just before serving add 2 tbs of butter to bring layers of flavor to the sauce. 1. In a large saucepan over medium-high heat, add crushed tomatoes and raw quarted onions (big chunks). Add basil, garlic, salt and pepper. When the garlic is done roasting add this as well. Let the sauce come to a boil, lower heat to low and stir occasionally until desired thickness. Drizzle with olive oil part way through the simmering to taste (I usually simmer for a couple of hours). Remove the big chunks of onion and just before serving add the butter. Pre-heat oven to 400. Combine beef, pork in a large bowl. Add eggs, cheese, basil, garlic and salt and pepper. Using your hands, blend ingredients together. Blend bread crumbs into meat mixture. Slowly add water, a bit at a time until the mixture is quite moist. Using your hands, shape the meatballs into rounds and place the meatballs in individual, miniature muffin tin cups. Bake for 15-20 minutes or until golden and cooked through. 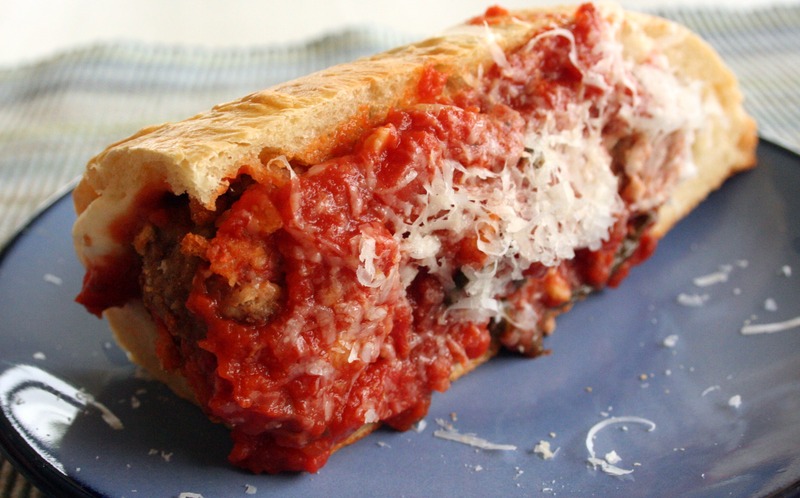 Finally, when you are assembling the meatball subs, use a nice crispier hoagie to absorb some of the tomato sauce. I dig out a small well in the lower part of the bun to let the saucy meatballs sit. I placed mozzarella cheese in the bottom of the hollowed out rolls, place the meatballs on top and then add sauce and cheese . Sprinkle with grated mozzarella cheese and then broil the sub so that the cheese is bubbly. Finally eat.